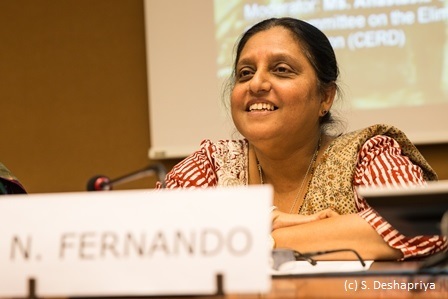 On Friday 17th March at the 34th session of the UN Human Rights Council, the International Movement Against All Forms of Discrimination and Racism (IMADR), jointly with Franciscans International and Minority Rights Group International (MRG), held a side event titled “Women’s and Minority Rights in Sri Lanka’s Transitional Justice Process”. The event was moderated by Ms. Anastasia Crickley, Chair of the UN Committee on the Elimination of Racial Discrimination (CERD) . Following three civil society representatives from Sri Lanka, Dr Nimalka Fernando, Ms. Saroja Sivachandran and Ms. Jensila Majeed, Ms. Rita Izsák-Ndiaye, the UN Special Rapporteur on minority issues , shared her findings from the country visit to Sri Lanka in October 2016. 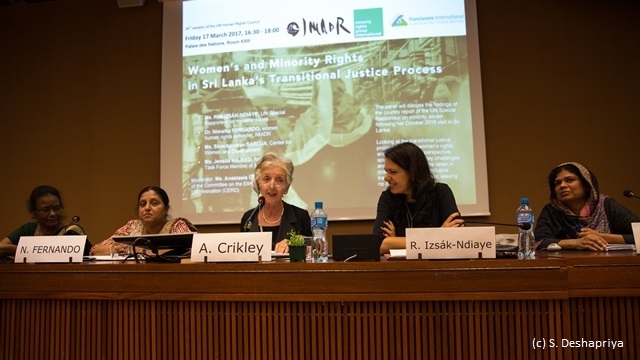 When opening the event, Ms. Crickley noted recent changes in Sri Lanka, and she informed the audience that the event aims to identify challenges and steps to be taken at the Sri Lanka’s transitional justice process through the lenses of women and minorities. Dr. Fernando welcomed the panel consisted of Sinhala, Tamil and Muslim activists from Sri Lanka who raised resources by themselves to participate in the Human Rights Council. She shared the difficulties of Sri Lankan women who are actually the majority in the population (approx. 52%). According to her, even though women’s rights are guaranteed in the Constitution, women have not been enjoying these rights in terms of political, social, and economic and civil environments because of the patriarchal dynamics, military, and the ethnic conflict. She pointed out that patriarchal, political, and cultural dynamics have made women to become a minority. Militarisation exacerbated the problem. Wars were always fought on the body of women. Sharing her experiences as a Sinhala Christian woman from a certain caste, an ethnic majority but a religious minority, she highlighted multiple forms of discrimination faced by Sri Lankan women. She stressed that forms of discrimination differ to Tamil or Muslim women. 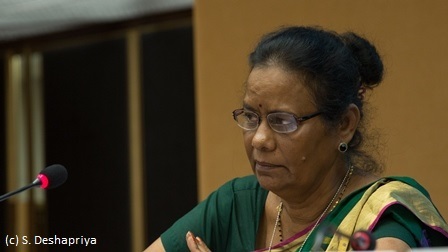 While noting the absence of a representative of the plantation Tamil women in the panel, she reminded the audience that they continue to suffer the particularly severe discrimination such as malnourishment, the lack of access to health and labour exploitation. She encouraged everyone to hold the Special Rapporteur’s report and ask hard questions on the issue of plurality. She put an emphasis on the importance of women’s participation in the transitional justice process. She criticised gender inequality in Sri Lanka which ranges from the burden on women to preserve the culture to the lack of substantial political participation. In closing, she put an emphasis that experience of every woman including Sinhala women should be taken up as everyone has suffered at the hands of patriarchal culture and religions. Ms. Crickley welcomed that the women human rights defenders from the ground were represented in the panel. She reminded the audience that “a dominant group” does not always mean the largest group as it was seen in South Africa’s apartheid. She reiterated that cultures change in direction to reinforce women’s human rights, or sometimes not. She emphasised the important role of women in transitional justice. While describing the Sri Lanka’s transitional justice process, Ms. Sivachandran pointed out that transitional justice is a new concept for the country and for most Sri Lankans. Among the four pillars of transitional justice, she expressed her reservations for the justice component because of the country’s culture of impunity. As mechanisms differ in each country, she stressed that Sri Lanka’s transitional justice needs to be designed based on the country’s specific context including the history and institutions. She emphasised the need of civil society involvement in transitional justice mechanism. She reminded the audience that women have suffered the most from the war, therefore they need to be consulted properly. She drew attention to unresolved issues such as enforced disappearances, extrajudicial executions, land return, and sexual violence against women and girls. She was alerted by the statements by the President and the Prime Minister which led to question the implementation of the Human Rights Council resolution 30/1. According to her, reparations can take different forms including compensations, return of lands and resettlement, as well as memorialisation, but so far these have not happened or for in very little. In ending her remark, she questioned the government’s political will to implement the transitional justice process with the 2 years extension of the OHCHR monitoring. 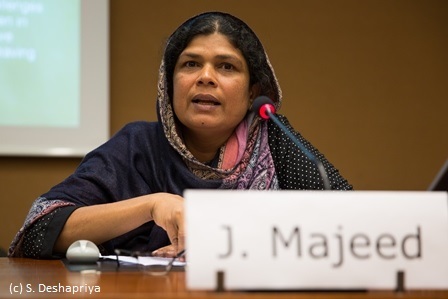 As a Muslim person, Ms. Majeed shared her community’s experience of forced displacement by the Liberation Tigers of Tamil Eelam (LTTE) in 1990. She pointed out the lack of will from both the government and the Tamil community representatives to resettle the displaced Muslims after the end of the war. As a result, Muslims in the Northern Province have had to struggle to return home. Compare to the other four districts of the Northern Province, only Muslims in Mannar district got lands. She highlighted the importance of land for Muslim women as a source of income generation. She also spoke of the issues associated with land such as the loss of voting rights and registration. Furthermore, she pointed out that while the issues of Tamils are discussed in the minority rights perspective, Muslims and their challenges are overlooked. She said, “Challenges of the Muslim community are unheard and submerged in the Tamil minority issues”. She stressed that Muslims in the North are a minority among minorities. She recommended to the government to: recognise the issue of forced displacement as an atrocity against Muslims by the government and Tamil political parties; ensure that resettlement policy and a commission are formed in order for Muslims to get justice; rebuild the relationship among the Tamil and Muslim communities in the North for reconciliation; and reform the Muslim Marriage Divorce Act to eliminate polygamy and increase the minimum age of marriage to 18 years old. Ms. Izsák-Ndiaye shared with the audience her thoughts on Sri Lanka based on the country visit. While appreciating the government’s cooperation in enabling full access to different areas, she described the visit as a very rich and emotional mission because of overwhelming testimonies she heard. She reiterated that the story of Sri Lanka is not just the story of Sinhalese or Tamils, but of all the religious and ethnic groups including Christians, Muslims, Hindus, Telugus, Veddas, Malays, Burghers and Sri Lankan Africans. She shared her astonishment by the country’s diversity when everyone from different smaller minorities she met spoke with great pride of being Sri Lankans. They also spoke of the importance to preserve their languages. She stressed their desire for being kept in the loop and having spaces for dialogue. She identified militarisation as one of the main challenges to transitional justice. Since they are almost homogenously Sinhala Buddhists, the army is seen as an occupying force in the land which are held without consent of the local communities. She shared her concern on the army’s commercial activities which local businesses cannot compete. The stigmatisation of Tamils in the North due to the presence of the military was also touched upon. She stressed the need to transfer the power to civilian forces from the army. Furthermore, she referred a threat to the identity by “Sinhalisation” of minority areas. Despite psychological impacts of the war are severe manifested in cases of PTSD, alcohol dependence and abuse, breakdown of social network, domestic abuse, and suicide, she realised that there is very little psychosocial support available to affected persons. Referring to the separate section in her report on minority women, she identified the challenges faced by minority women are complex and need a special attention such as female heads of households, war widows, and women searching for family members. She was alerted by testimonies that sexual favours were demanded in exchange for papers, harassment of former female LTTE combatants, late night visits and phone calls by the security personnel. She identified the lack of evidences and accountability is a challenge to address the issues of minority women. She highlighted the historical marginalisation of plantation Tamil women who are excluded from the partriacal decision-making process. She recommended the reform of Muslim personal laws in order to comply with international human rights standards. According to her, minority women are often fall in between the minority rights discourse and the women’s rights discourse, since minority rights movements are led by minority men and the women’s rights discourse is dominated by majority women. She was particularly alarmed by the high level of polarisation in the Sri Lankan society. She encouraged Sri Lankans to work for social cohesion instead of dividing themselves into their own groups. 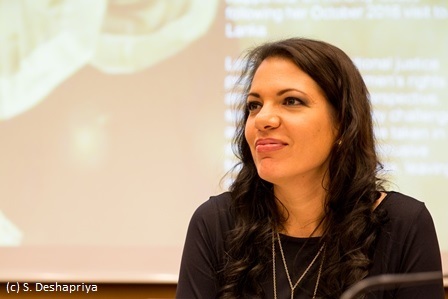 She expressed her hope for the Sri Lanka’s future because of the high level of awareness of people on human rights issues. In ending her speech, she suggested the need for a joint advocacy planning by civil society, member States and the UN human rights system as a next step for Sri Lanka. In addition, she put an emphasis on the need to have diverse government institutions which are represented by minorities to establish trust between communities and the government. Ms. Crickley thanked the Special Rapporteur for the comprehensive intervention. She reiterated that many concerns raised by the panellists and the Special Rapporteur were also taken up in the concluding observations of the CERD. She stressed that the task in the side event was to consider areas where joint-cooperation is possible. In the interactive discussion, some participants shared their experiences in Sri Lanka which they witnessed the struggles of women and minorities including due to the military’s presence in the North. A question was asked to the Sri Lankan panellists to suggest one top priority measure that will help reinstalling the trust in the authorities. While Ms. Sivachandran said that the question was also question for her, she stated how the issues of minorities and minority women are taken into consideration should be observed. Ms. Fernando answered that seeing 50% of Parliament consisted of women is her dream. Yet, she pointed how the Constitution making process will open doors for women as well as for power sharing. Ms. Majeed reiterated the internal marginalisation of Muslim women within their own community, therefore the Muslim personal laws need to be amended. One activist from Sri Lanka pointed out the core issue that even minority political parties do not recognise the participation of women, which keeps minority women being marginalised. The Special Rapporteur shared her experience in Sri Lanka which she had to make sure that no men were present in her consultations with minority women, because they feared reprisals. She had to install security measures even some women were in exile. She was very alarmed by this experience. Her recommendation to the government would be to have women-only meetings belonging to different groups to forge solidary and establish open spaces for dialogue. 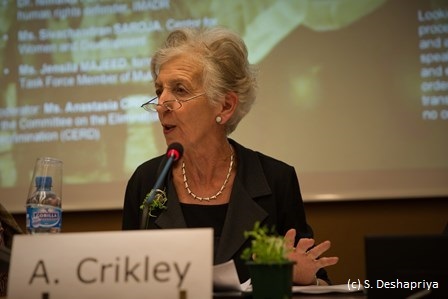 In concluding, Ms. Crickley described the discussion as a key moment to reinforce the transitional justice process to take on board the complexities of the issues of women and minorities across the situation. Lastly, she emphasised that it is important in many ways to look at joint-advocacy planning.